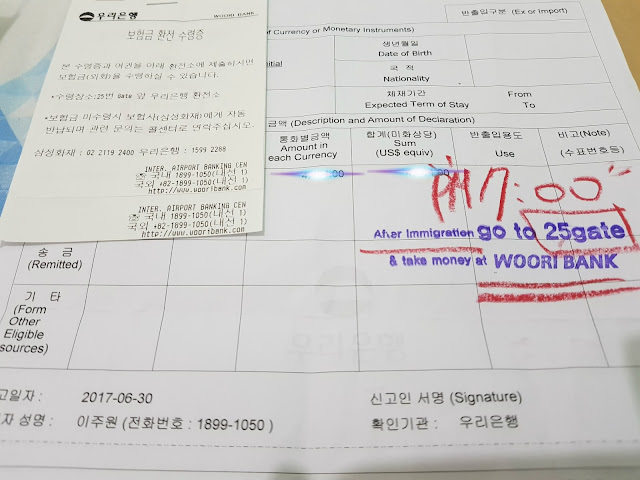 The Twejikum (퇴직금) is one of the benefits that a migrant worker in Korea can avail after the sojourn in South Korea. It is also called “severance pay”, a lump sum of money paid by the employer for the number of years that a particular worker has served the company. Those who were able to work in one company for a minimum of one year or more are qualified to receive the severance pay. 2. Get the average pay per day by dividing the sum of your Last 3 months salary by the total number of days of last 3 months. 3. Compute the Average salary in one month by multiplying the result of number 2 to 30 days. 4. Compute your Twejikum by Multiplying the result to the number of years of service. Now that you know how much your twejikum is, the big question now is how to claim it! Your boss should pay you that amount the moment you leave the company. Basically, they have been paying for your severance pay already via the Departure Guarantee Insurance. However, as they are only paying 8.3 percent of your monthly salary, your boss should pay you upfront for the remaining amount. Say for example, your boss was able to deposit a total of 6,000,000 won in your departure guarantee insurance, he should pay you a total of 9,177,000 KRW- 6,000,000 KRW which is 3,177,000. This amount should be deposited in your payroll account along with your last salary or whatever account you want to nominate. How about the 6,000,000 won? Where should you claim it? You should claim it at the airport. Your boss will let you sign up a form where you can nominate a bank to which you want to claim the remaining amount of your departure guarantee insurance. Once you signed up the form, all you need to do is wait for your date of departure and claim it in the airport. When claiming Twejikum at the airport, you must go to the bank you nominated at the third floor of Incheon Airport. Usually, they are located near the boarding gates of the airport. You can ask around or look it up yourself, they are not difficult to find. Once you’re at the currency exchange center of the bank of your choice, they will simply ask you for passport and Alien Card. They already know you are coming, there’s no more fuss or asking for extra document when you approach them. They will convert your money into dollar denomination, and after verification, they will give you a receipt of the conversion of your money. You must present this receipt at the bank after passing through the immigration so they will give you your cash. Don’t worry, they will provide instruction as to which gate the bank is located, all you need to do is enter the immigration and proceed to the gate they suggested to find the bank and get your cold cash! That’s it! It’s not really that complicated. If you know how to follow instruction, you can get your twejikum without a fuss. For better flow of transaction, it would be better if you book a flight at night time and during weekdays. Yun pong kukmin paano i-claim? Sa incheon airport po ba yun o sa pinas na makukuha? it's up to you jhonel. I'm in the process of writing about claiming kukmin at the airport, hopefully, i can publish it within this week, watch out for it. What if My end of visa is April 17 and i work till april 12 what months they will base the computation? computation will be based on the actual date when you stop working. so, it should be computed up to april 12. Which salary are they going to use for computation sir/Ma'am. The Gross, or Net salary? Tnx. It should be based from your gross salary. Is twegikom same as twegik yeonkum? 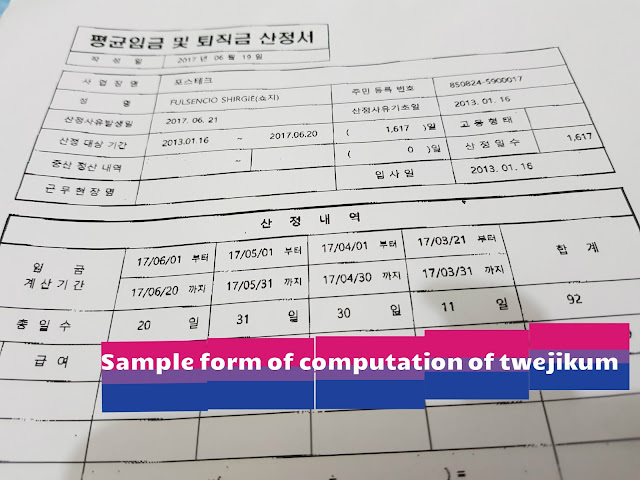 Is the computation of twegikom for korean husband is the same as EPS? Good day pede napo ba maclaim twejikum sa gimhae airport? last 3 months salary based on months or based on days? ie. 90 days. than march 31+ April 30 May 31 =92 days? Your salary from february 21 to february 28 + Your salary from March 1 to march 31 +your salary from April 1 to April 30 + your Salary from May 1 to May 21. GOOD AFTERNOON MAM,,,ASK LANG SA AIRPORT PO ALIN PO ANG UNANG I CACLAIM TEJIKUM PO B O KUKMIN,,TNKS PO. Happy good day po, ask ko lng po kung isa lang po ba ang format ng pagcompute ng twejikum ng company? Paano po kung 1 year and 10 months lang ako. Pano po cinoutation dun??? Hello, is it possible na ibang monthly wage ang ibibigay ng employer for computation? And possible po ba na mas mababa pa sa basic ngayon, ang ibigay ng employer na monthly wage for computation? hello po dito na po kasi ako sa pinas mahigit one month na po ako dito. paano po ba yung proseso ng pagkuha ng twegikum dito sa pinas. Good day! I'm still confused between twejikum and kookmin. Are they the same or entirely different benefits? Am I entitled to both or just either if they are the same? I will be leaving by end of August or early September. Thanks in advance! Good day ma'am/sir. Kailangan pba ng bank account sa pinas para makuha yung twejikum at kukmin? Or cash na po kukunin lahat sa incheon airport? 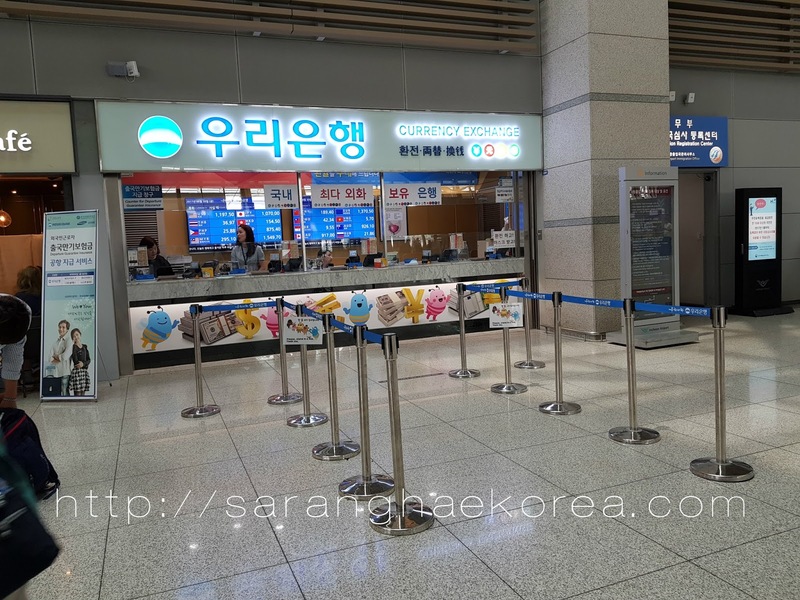 Mam tanung lng po magkaiba po ba yung kukmin at tuwegigum mam..
Can we get twejikum in busan (gimhae)airport or only in incheon airport ? Mga kaEps,may bagong rules ba sa NPS ngayon na pag rehire hindi na makukuha ang kukmin?kasi uuwi na s march 8 yung kasama ko galing sya sa NPS kanina.ang sabi hindi nya makukuha yung kukmin nya kasi babalik pa daw xa.may naka experience ba ng ganto? ?thankx Admin..
My husband told me .khit na sincire ka dw mkkha mu dpt ung mkkuha mo .bsta ntpos ung 1st contract mo . Hello hiw about po pg nsa pinas kana .may chance pba mkuha at paano po?